American Trails is proud to have Pam Stoehsler as our featured artist of the month. Pam portrays close encounters with nature, and gives you a view of wildlife not often seen by the casual observer. Her exquisitely detailed and realistic portraits of birds and animals bring to life natures secret moments. 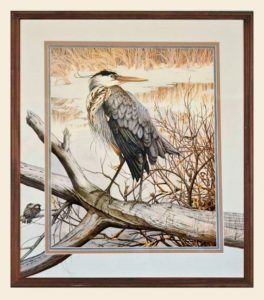 The artist grew up in the small northern California town of Adin, where country living prevailed and wildlife was abundant. She now lives in Klamath Falls, the west’s largest flyway for northern bird migrating to California and Mexico, offering Pam a unique opportunity to photograph and observe a large variety of birds and other wildlife. Some of Pam’s many achievements include: winner of the Oregon Upland Gamebird Stamp in two consecutive years, 1995 and 1996, California Upland Gamebird Stamp in 1997, Oregon’s Ducks Unlimited Artist of the year in 1998, California Upland Gamebird Stamps in 2000-2001 and 2002-2003. She was also awarded the opportunity to create three paintings depicting early coastal life of the Coos, Lower Umpqua ( of which she is a member) and Siuslaw Native Americans. The paintings are displayed in the Coos Bay, Oregon tribal office. Pam will be in the gallery on July 15th from 12-4 to discuss her artwork. First Friday Artwalk– Musician Jon Galfono will be performing and as always food and refreshments start at 5.